JOB LOT OF 15 VINTAGE STYLE SMALL FREE STANDING SILVER TONE METAL PHOTO FRAMES. With mirrored side sections & beaded effect trim. Takes a 5x7 picture. Vintage style pewter,metal decorated freestanding photo frame. Vintage style pewter,metal decorated freestanding photo frame.. Condition is Used though good.. Dispatched with Royal Mail 2nd Class. 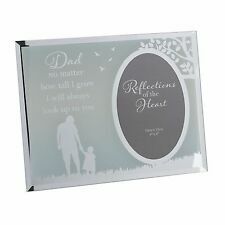 Beautiful Silver Grey Crushed Velvet Effect Photo Frame Fits Photo 5.5" x 3.5"
Fits Photo 5.5" x 3.5". Images are of the actual item. PHOTO SIZE 9cm x 13cm. SILVER PLATED. 22cm x 18cm and the picture size would be an approx. 18cm x 16cm. Fantastic Pair Of Vintage Brass Photo Picture Frames Fits Photo 4.5" x 3"
Can either be positioned landscape or portrait. A couple of dark spots on the brass that should polish out if desired. Fits Photos 4.5" x 3". Images are of the actual item. Perfect for displaying old sepia/ black & white photographs and can be positioned either vertically or horizontally. MADE FROM HEAVY PLATED STEEL OR STAINLESS STEEL, THE FRONT COVERED WITH LEATHER. Lovely Antique Style Walnut Effect Photo Picture Frame Fits Photo 6.5" x 4.5"
Can either be in the landscape or portrait position. Fits Photo 6.5" x 4.5". Images are of the actual item. Etched with a mountain scene of trees and a house. Slip in photo to the back, glass in place with a very minor scratch at the top. With mirrored side sections & beaded effect trim. Takes a 4x6 picture. Gorgeous Antique Style Walnut Effect Photo Picture Frame Fits Photo 7" x 5"
Can be to display photos portrait or landscape. Fits Photo 7" x 5". Images are of the actual item. Pair Of Antique Style Silver Coloured Beaded Edged Frames Fits Photo 5.5" x 3.5"
Fits Photo 5.5" x 3.5". Can be to display photos portrait or landscape. Images are of the actual item. Fits photo approx 4.5" x 3". Images are of the actual item. In excellent used condition and all ready to go! Large Vintage Style Walnut Effect Photo Picture Frame Fits Photo 8.5" x 6.75"
Fits Photo 8.5" x 6.75". Images are of the actual item. Beautiful Oval Vintage Photo Frame. Condition is Used. Dispatched with Royal Mail 2nd Class. Can be positioned landscape or portrait. In good condition. Images are of the actual item. Vintage Metal Climbing Roses Design Photo Picture Frame Holds Photo 7" x 5"
Large Walnut Effect Vintage Style Photo Picture Frame Fits Photo 8.5" x 6.75"
Freestanding easel type design. Lovely ornate design. 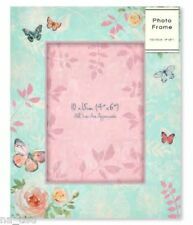 Picture Insert - 2.25" / 5.5cm x 2" / 5cm. Can be positioned landscape or portrait. Images are of the actual item. Cream shabby chic style. Ideal gift for house warming ect. Lovely Silver Grey Crushed Velvet Effect Photo Frame Fits Photo 5.5" x 3.5"
Fabulous Vintage Style Swirl Metal Photo Picture Frame Fits Photo 7" x 5"
Can either be in the landscape or portrait position. Fits Photo 7" x 5". Images are of the actual item. Made from polished hand lacquered brass ~ easel stand ~ with glass ~ black felt backing. Great Pair Of Vintage Style Square Wooden Photo Frames Fits Photo 4.75" x 4.75"
Fits Photo 4.75" x 4.75". Images are of the actual item. Easel Backed. Can either be positioned landscape or portrait. A couple of dark spots on the brass that should polish out if desired. Fits Photos 5.25" x 3.25".